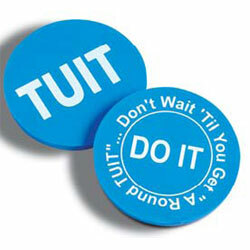 Buy Your Round Tuit Here OR GET IT DONE! Yesterday I offered a Make YOUR Business Memorable Memorial Day Giveaway Marathon DO IT NOW Session so that one fortunate small business could benefit from everything in my Small Business Internet Marketing Starter Package and then some. I should have known a fellow blogger like Kelli would be the most enthusiastic when it came to what I offer because she is much further along in understanding how to promote yourself online. By working with Kelli to promote her new best deals blog (Follow her new Twitter account @Deals3BD53) I can demonstrate to bloggers how they can collaborate with two to four bloggers in their niche and push ALL their blogs to the top. Some very interesting Case Studies and before and after stats will come from that project. While I am excited about that too, my intention was to show small businesses how much getting their free advertising in Local Search Directories, having them featured in blog posts, and teaching them how to effectively grow and use Twitter can benefit them. WANTED: At least one small business to feature in Case Studies! I would love to write a compelling story here about why what I do works – but the problem is that every business owner is starting from a different level of experience. It is simply not possible to explain what I do and while I’m happy to teach them if the want to know – success does NOT require understanding 99% of what I can do for them. …how about me just getting it done! How much research and how many ebooks, courses, blog posts have we all seen? Have we implemented everything we’ve read? NO! Why? Either we don’t know how and really have no interest in learning how OR we don’t have the time. I have come to realize for many things I do not want someone to teach me how, or to take a course – no matter how good it is. I just want what is important DONE already. And I want it done by the best – optimized and effective. Yesterday – or at least TODAY – not next week, month or year. So let’s get TUIT. If you’re a small business that wants to see results and is ready to get started immediately, leave a comment. Since I know news doesn’t spread as fast in small business circles there is no deadline. I’ll pick one business by next Monday, but if you have a great business and are enthusiastic about making this happen I might pick you too! What do you have to lose? Good idea to grow a small business. I would suggest online marketing always a great way to grow any business and you can take some helps from social networking to promote your business in such way. Am I too late to the party? If not, I’d LOVE to throw my hat into the ring for your mentoring offer. You’re not too late. I do mentoring all the time in groups and one-on-one AND I’ll be sharing what the group I’m working with now is doing and putting together more groups to apply what we learn. If you use Skype look me up. I’m the only GrowMap there. I really hope some small businesses see this and take you up on this offer. I have found sooooo much great advice here at GrowMap and just following your Twitter advice for a couple of days lead me to one of the biggest clients I’ve ever had. I’d love to return the favor. So when you do decide on a small business to help, let me know if I can help with any writing you might need. As soon as I get some posts up about the blogger group I’m mentoring I’ll be working with a small business too. My current challenge is that bloggers understand what I’m doing much better than business owners because they have been working on it longer. Once I can get some traction with small businesses I would love to be helping so many that I can sub some of the work and writing to other bloggers. I’ll be sure to keep you in mind for that. Hi there, I am a new small business owner….i have a page on facebook and i sell designer preloved clothing. I started my page to get rid of the ebay stock i had….i had been selling on ebay for a few years but never seemed to actually make a profit, it was eaten up in ebay fees, or paypal fees etc etc etc. So, i started my page with a very mundane name Tami’s stuff for sale, sold a lot of my stock, made some money and decided that i would continue selling on facebook…after all there are no fees, i have a target audience (other stay at home mums) and there is quite a supportive community of other pages who are willing to do shoutouts and get people to your page. I would be interested in learning as much as you can teach me to improve my business, i am a Work at home mother myself and don’t want to work full time as my children are, and always will be my number 1 priority however if i can make my business work better then i would gratefully accept any advice you have to give me. I am in the process of relocating my page…as the one i have now was started very quickly without much thought…it was simply to make enough money to get rid of my stock as id given up on ebay and to get my car registered! but i have done so well that it seems silly to stop…so my new page is like a clean slate, i have enough followers now and understand my market well enough to do a page relocation successfully…. i am pretty clueless when it comes to social networking, and have much to learn, but i’m keen and willing if you are keen and willing 🙂 I followed you here from another blog by the way….Jennifer Mattern’s blog from last year “Does social media support liars”…i liked what you had to say and resonate with it very strongly. Anyway, let me know if you are interested in mentoring me or even if you have a little bit of advice…I know I’m not a big small business LOL, im just a stay at home Mum whose guilty pleasure is op shops, garage sales and markets on a sunday who has found a way to a) get away with the weekly bargain hunt and b) make a tidy profit from it. I’d love to see whatever you have up on Facebook or elsewhere. Could you share the links? You can reply on Twitter or put them in a reply comment here. I see you’re pretty new to Twitter so the first place to start is with my Twitter Best Practices. What a great offer! As a small business owner who has spent hours trying to learn Internet marketing on the job, I can definitely see the value. What an interesting concept for an automotive repair shop. I’m actually surprised that I have never seen anyone do that before. I added anchor text after your name so you could benefit from that link. I am growing two Twitter accounts in your geographic area – one @DallasMetro and another for @KaufmanTx so be sure to follow those so I can share your tweets with those in your immediate area. I will be ramping up activity in both of those accounts shortly and following as many people in the Dallas metro area as I can locate. Thank you! We are really hoping that people like the idea and that it takes off. So far we are having fun with it. I’m now following those two accounts. I’m afraid twitter is a weak spot right now… I’m just clueless on how to build on it. This is a great opportunity you are giving a lucky smb owner. The fact that you are basically offering to mentor them is very generous on your part. I look forward to seeing a case study or two. Years into working online I came to the realization that one-on-one mentoring is the fast way to get things done – and that since most bloggers and small business owners don’t have big budgets that I would do all I could to assist them regardless of their ability to pay. That does make for some cashflow issues as you can imagine; however, I have never regretted it and love what I do. I just wish more smbs could grasp what I’m trying to show them. Since you mentioned Case Studies I will share one of my favorites so far that shows how important claiming your free advertising on major local search directories such as Google Places and Yahoo! Local are to small businesses. My friends build gazebos and their business is getting 75 visitors from small local directories for every 100 visitors they get from Google. These results amazed even me: Local Search Traffic Case Study. I really appreciate your spreading the word and I do assist many bloggers one-on-one on Skype, and in the comments here, and by sharing strategies in blog posts and on Twitter and elsewhere. Any time I can assist you just let me know. Wow, this makes me wish I had an actual small business, not just a blog with hopes to sell my parenting or self-help eBooks online and grow a business from my expertise. This could be really incredible because you’re absolutely right: often those courses and seminars and how-tos never get utilized to their fullest potential because the learning curve to implement everything is just too long, or too difficult, and we need results NOW. Not next year, or even next month, but in the next few days! I just had that conversation with Ivin @Authopublisher. I won one of his how-to-get-your-list-building going mentoring programs. I was picturing one-on-one get-it-done not an extensive learn-how-to-do-it process. I realize that is what I really want. I just want it done. I don’t need to know all the ins and outs of how. One-on-one sharing what we know can allow us to make HUGE progress towards our goals. That is why I give away most of my time – to get other bloggers using what works for me and implement myself what works for them! If you use Skype or IM connect with me and I’ll answer your questions, give you tips, we can swap strategies, etc.